This excellent ad appeared in the Chicago Tribune on Thursday. 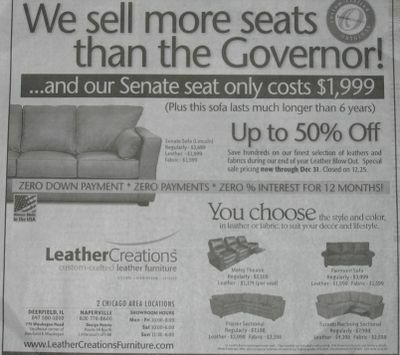 It's not clear whether this was originally called the "Senate Sofa," or they renamed it to take advantage of the opportunity. But who cares? I know Blagojevich insists he can continue to govern, but how can you get any respect from a legislature if you're being openly mocked by furniture dealers?